When you find that Carolyn Dinshaw's Getting Medieval: Sexualities and Communities, Pre- and Postmodern and The Gossip Girl and pomengranate martinis are on your mind, it must be almost August, and almost time for In The Middle's Book Club for Discerning Scholars of the Middle Ages, or ITMBC4SoMA-palooza, or something like that. So get out the cocktail shaker, decide how you feel about the "is she or isn't she naked?" Blair Waldorf ad scandal, and crack [or re-crack] open your copy of Dinshaw. Because sometime soon, at an In The Middle outlet near you, we'll be discussing this book [re-visiting it, as it were], and yes, also watching The Gossip Girl [well some of us, I mean Eileen, will be]. In the meantime, please read Mary Kate's "This I Believe" post and Jeffrey's two posts on the New Chaucer Society meeting here and here. Are we allowed to participate if we are devoid of Gossip Girl and pomegranate martinis (the latter of which I know are imbibed only for their antioxidant effects)? Or are these things mandatory? Jeffrey: I know you make a mean pitcher of Sangria, so you can substitute that for the pomengranate martinis [and also, purely for its antioxidant effects]. 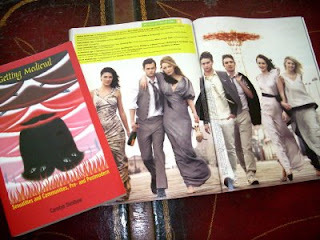 As to "The Gossip Girl," nothing is mandatory, of course, although, without it, I pity you. Do you have any idea how "queer" this show is, while also being utterly hetero-sexist?